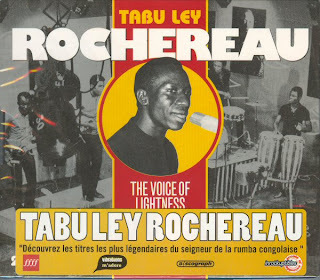 Back again with a new CD (well, released in November 2015 already), but I bought it this week. I saw their concert on 9 April this year, in RASA, Utrecht and I was quite happy to witness this concert, especially because Bamba Wassoulou Groove create a modern version of the Bambara afro-rock by late Zani Diabaté's Super Djata Band, one of my all-time favourites. It has been many years since our latest post. I received this album in the post today, and I actually thought of scanning it before opening and removing the shrink wrap. 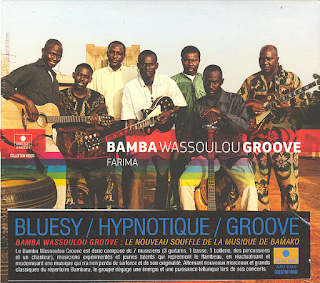 The album is covered with a classic sticker with the name of the artist and the title of the album, plus mentioning a featured artist, singer Piers Faccini. To the right, there is a, seemingly, press text, although the origin is not known. On the right top, there is a Quality Label, « un événement fff Télérama » (a fff, as in 3-Star event by the French Magazine Télérama). I will now unwrap and enjoy listening the album ! 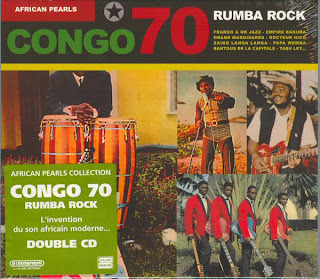 Syllart's African Pearls Collection comes with a uniform sticker to attract the attention of the potential buyer to the importance of the songs featured on these compilation CDs. In France, one of the quality labels given to CD albums, are the Sélection FIP. 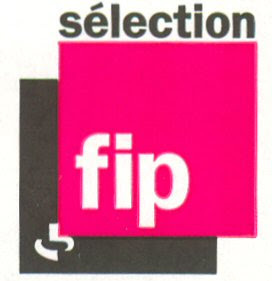 FIP, one of the radio frequencies of Radio France, gives this label to six albums per two weeks in any of the musical genres, be they Jazz, Blues, French chansons, Anglo-saxon Pop-Rock or World Music. 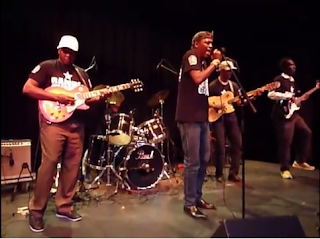 The label aims to help choose the public among the numerous releases. The albums are promoted on the radio station during one month. 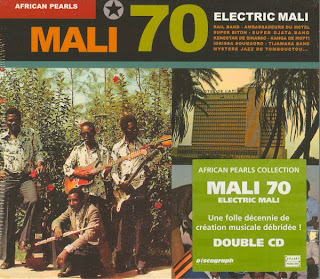 I just received a new order with two outstanding albums from Mali, i.e. 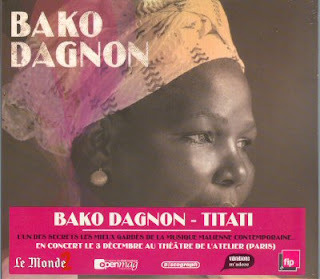 Oumou Sangaré's « Seya », and the latest album of Kasse Mady Diabaté. I will start with the first one. 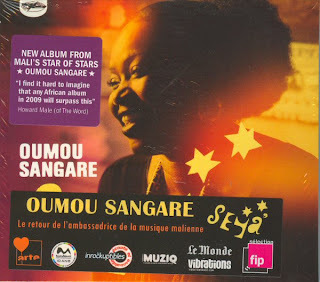 On Oumou Sangaré's album, there are two stickers. The first is a small sticker with a very positive press comment by Howard Male (The World). 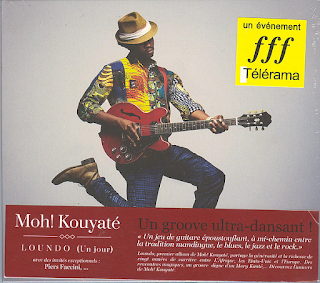 On the bottom of the album, there is again a large sticker with various logo's, such as Arte TV, Mondomix, Inrockuptibles, Muziq, Le Monde, Vibrations and Séléction FIP. These organisations all recommend the album. 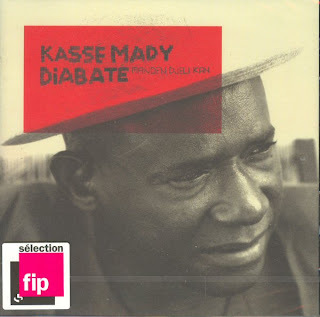 The album « Manden Djeli Kan » by one of my favorite singer Kassemady Diabaté comes with a simple artwork with few colours and nearly low-res graphics. Sticker-wise, there is just the Sélection FIP recommendation. But the music is great! It has been a while, I know. I am still not very sure that these promotional album stickers are indeed a passionate subject to have a blog about. I am afraid that the number of blog views reinforces this doubt, actually nobody is taking a look at this blog. 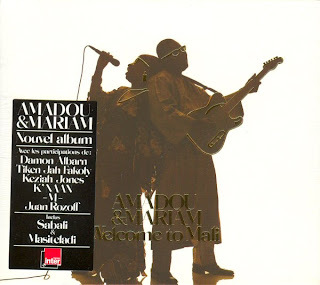 Anyaway, I take the latest album by Malian star blind couple Amadou & Mariam as a example. Here, you can see a sticker that is put on without much love, it is not at all put on straight, it is covering part of the art work of the album, and the typography, although stylish, turns out to be less fortunate: the visibility of the names of the featured artists (Damon Albarn, Tiken Jah Fakoly, Keziah Jones, K'Naan, M, and Juan Rozoff) is far from optimal. 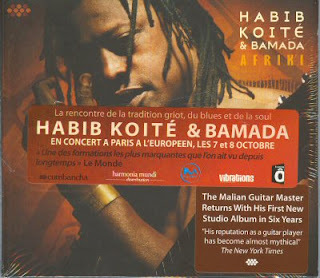 On Habib Koité's «Afriki» album, a large horizontal sticker in French announces two concerts in Paris, whereas the American label Cumbacha had already put a sticker with a New York Times review.